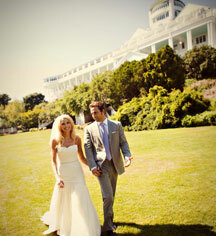 For decades, Grand Hotel has served as an exceptional locale for countless weddings. Today, the hotel is well prepared to host weddings with up to 450 guests. 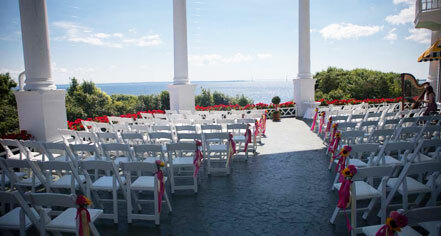 Wedding ceremonies are held in two beautiful locations. The legendary Grand Hotel porch is lined with boxes filled with red geraniums. From this one-of-a-kind vantage point, you and your guests can see the Straits of Mackinac, Mackinac Bridge and the Grand Hotel gardens below. A second location, the Grand Hotel Tea Garden, sits amidst the painstakingly maintained flower gardens, and an immense imported stone fountain is the Tea Garden’s centerpiece. A full-service Aveda salon and flower shop are in the hotel and can be made available to members of your wedding party. Five formal private dining rooms are available, three of which feature dance floors. Luncheons and dinners are multiple-course, plated meals. Grand Hotel also offers four casual off-site restaurants - The Gate House, Woods, The Jockey Club at The Grand Stand, and Cawthorne's Village Inn - all are perfect for a rehearsal dinner or smaller wedding party. Automobiles are not allowed on Mackinac, where slower, more leisurely modes of transportation—horse-drawn carriages, bicycles and, of course, two feet—are common. There are countless activities in which your guests can partake, from 18 holes of golf on The Jewel to the island’s many attractions. A schedule can be arranged through the concierge upon arrival. Marty Haines, the specially trained Wedding Coordinator, will handle every wedding detail, including cakes, floral arrangements, and music. Grand Hotel chefs can create a menu to satisfy your tastes, and The Grand Hotel Orchestra can provide live entertainment.